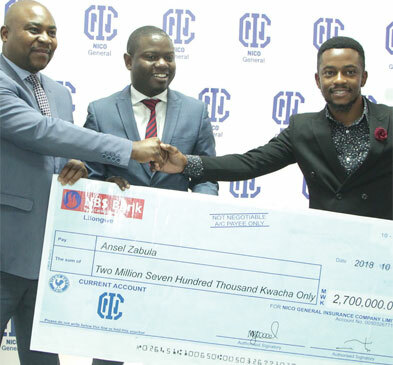 Nico General Insurance Company on Friday presented a settlement Cheque of K2.7 million to Ansel Zabula, one of the victims of fire accident that occurred on September 29 2018 during Lake of Stars Arts and Cultural Festival held at Kabumba Hotel in Salima. Zabula’s vehicle, Mazda Demio registration Number CA963, was among four vehicles that caught fire and burnt to ashes at the festival. Nico assistant General Manager, Zalimba Makawa, said the vehicle was insured under a comprehensive insurance cover, hence it was the company’s responsibility to take care of their client’s loss. Speaking after receiving the cheque, Zabula expressed gratitude with the settlement that Nico has provided after the loss of his vehicle. “I have been with Nico for all over two years and our relationship has been good. I am very happy because it’s a huge loss but they have bailed me out. Others have completely lost out,” he said. Unconfirmed reports indicated that fire started after rear tyres of one vehicle were in friction with grass which led to the car catching fire and spreading to other vehicles . Lake of Stars Festival Spsokes person Zilanie Gondwe told The Daily Times recently that the festival does its best to consider contingencies and health and safety. “We encourage camping which sometimes has cooking camp fires. Food vendors and hotel engage in open fire cookin; therefore, we understand and aim to seriously mitigate the risk of fires at every festival,” Gondwe said.